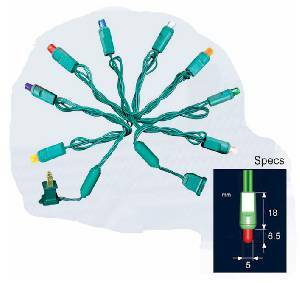 The Next Generation of LED Holiday Lights! Most LED lights use AC power straight out of your outlet. This causes the lights to turn off and on at 60Hz. In other words, they "flicker". 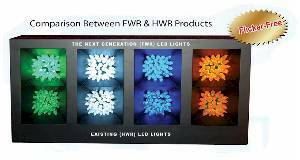 Our LED lights are Full Wave Rectified and have inline rectifiers which converts AC to DC. This removes the flicker, makes the lights brighter, and allows the lights to be dimmed which makes them great for light shows. We're so confident that our LED lights are the best on the market that we give a FULL ONE YEAR Warranty on all the LED Lights that we sell! Safety First! Our new construction employs a new wiring pattern that places the input and output of the AC current at the two ends of the PC board with a hollow channel in the middle to hold the rectified DC current at one end of the PCB board only. 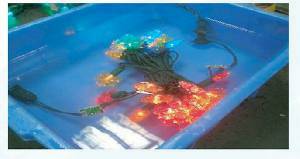 Therefore, it eliminates the major safety problem of electrocution even with the PCB board unsealed. Our light strands have completely sealed LED bulbs and sockets. The sockets and bulbs are injected molded together to form a completely weather proof seal. This system prevents lost bulbs, rusting sockets and shorts from water entering the system.